Anoles are the most diverse genus of living reptile, with almost 400 extant species. Anoles have adapted to a variety of microhabitats and adopted a number of different life histories as they have diverged from each other. Despite this diversity, the basic reproductive process is similar in most species. 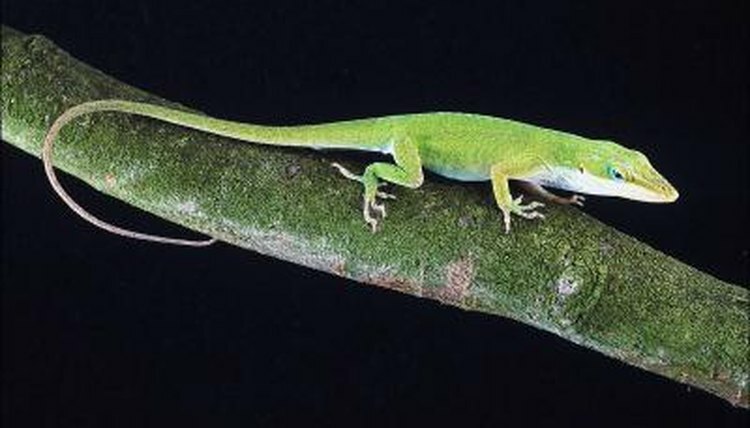 Anoles live throughout the tropical and subtropical Americas, including the islands of the Caribbean, where they reach their greatest diversity. Most anole species are arboreal, though a few species do prefer living on the ground. They are primarily insectivorous, though they will lap nectar or soft fruit from time to time. Additionally, anoles will consume seeds and may play an important part in seed dispersal. Some of the larger species, like the knight anole (A. equestris), add small vertebrates, including other anoles, to their diet. Though the average life expectancy of a wild anole is not very long, scientists have documented green anoles (Anolis carolinensis) living up to 10 years. Males of most species engage in species-specific territorial displays intended to drive off rivals, and attract mates. Tropical species may breed at any time of the year, but the 8-inch long, North American green anole only breeds in the spring and summer, when conditions are favorable. When breeding, male anoles bite the female on the back of the neck while they insert one of their two hemipenes into the female's cloaca. Wild female anoles dig a small hole into a damp soil substrate in which to deposit their eggs. Females may deposit eggs twice per month, for a period of four or five months if conditions are ideal. While most clutches contain a single egg, occasionally, a female will deposit two eggs at the same time. By producing rather small eggs, approximately 1/4-inch long for green anoles, anoles are able to remain mobile while carrying their eggs. Unlike the egg of a bird, whose parent’s must keep it warm, soil temperature is the primary driving force in the development of an anole egg. This causes great variation in the length of incubation; eggs exposed to warmer temperatures develop more quickly than eggs exposed to cooler temperatures. Even when kept under laboratory conditions, anole eggs vary in their incubation time. In general, anole eggs hatch after 30 to 45 days. Scientists don't know the hatchling size of many species of anole; the well-studied green anoles produce very small hatchlings, measuring about 2 inches in total length. They must care for themselves immediately, as their mother provides no maternal care after depositing the eggs. Hatchlings start looking for a safe place to hang out, and then begin hunting tiny insects a few days later. Anole Annals: How Big Are Hatchling Crown Giant Anoles?